Ever the tomb raider, I had been tromping around alone in the Arizona wilderness for 9 hours looking for a remote Verde Hohokam cliff dwelling that was rumored to be so magnificent it is referred to as “Little Montezuma’s Castle”. With not much to go on besides a GPS coordinate (that ended up being wrong by about a mile) and some vague trail descriptions, I made it within a quarter mile of the ruin, but just couldn’t seem to locate it. My main problem was cows. I was on a mesa above Sycamore Canyon near Jerome, Arizona. This is open range cattle country. On the plateau, high above the Verde River where I was hiking, there is something of a natural sink where water accumulates during a rain. For this reason cows from all over the range gather at this tank to drink. That is all well and good except that cows are heavy and tend chew up the earth when they walk leaving misleading trails all over the wilderness. Furthermore, cows know and care nothing for archaeology so they make terrible history guides. I followed cow trails left and right, up and down hillsides, each time sure I’d found a good route to my treasure, but all of those trails lead me in some ridiculous direction off the course. It was so frustrating and I began to fester a deep and abiding hatred for cattle. Being way off track did, however, yield some unexpected pleasant surprises. One cow trail lead me past a fantastic old, disused fire ring of indeterminate vintage. It could have been used 800 years ago by the native Verde Hohokam, or it could have been from the cowboy days. 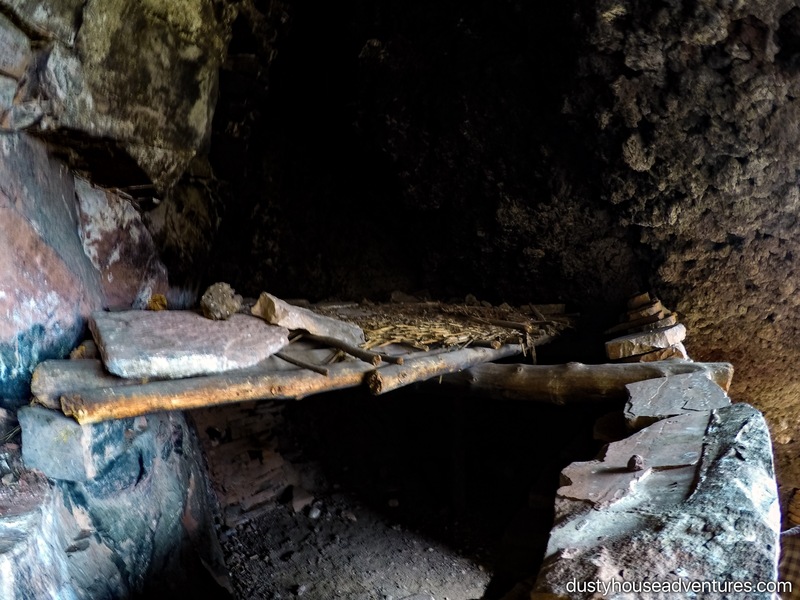 But better than that, while bushwhacking straight up a steep rocky hillside and stumbling into a bush (whose resident immediately started rattling fiercely at me) I saw something that looked like part of a cement pipe sticking up on end out of the dirt. Although it was the same color as the surrounding rocks, it was clearly human-crafted. It took me a couple of minutes to understand what I was looking at. My mind was running through possibilities. “Am I closer to civilization than I thought? Is this a piece of a cement pipe?” “Is that a…? No, it couldn’t be. Is that a broken metate?” A metate is a long rock that has a concave depression, shaped by prehistoric peoples for use as a grinding stone. One uses a rolling pin sized rock (a “mano”) to grind corn, seeds, and other foods in the depression of the metate. I bent down and pulled the metate out of about 2 inches of dirt and there was no question about it. It was a metate that was broken in half, lying on end in the dirt. I was very excited about this find. (Later when I visited the Tusayan Pueblo ruin and museum at the Grand Canyon, they had a metate on display exactly like the one I found.) I wish I’d had the presence of mind to wonder if I had stumbled upon a midden (an ancient garbage heap) and pecked around for some more artifacts, but all that was on my mind was “Bingo!” I’m really really close to the cliff dwelling! I staggered up the rocky slope toward that dastardly misleading GPS coordinate and terminated at the edge of a steep cliff overlooking Sycamore Canyon thousands of feet below. The GPS coordinate I was following would have plunged me over the cliff and into the river. The view was spectacular, a panorama of the river that cut its way deeply around two promontories forming a double horseshoe bend. I meticulously skirted the entire rim of the mesa, but could find no cliff dwelling or even a hint of where one could descend to look below the lip for it hiding beneath. It was now 5:30pm (sunset looming at 7:00pm) and I was staring down the barrel of a 7.5 mile hike back to my car. Totally discouraged and wishing death upon all bovine creatures I started the long trudge back toward the car, mentally cataloging the less spectacular finds I’d made on this would-be ruin run. I was thoroughly disheartened and started to slip down into the dark side where I go when feeling very defeated. Here’s what you don’t know about me. I had a younger sister who was my soul mate. We might as well have been twins, in fact we were in a sense twins because we were both Gemini “Twins” born two years and two days apart. She was my “huckleberry friend”. Did you ever see Audrey Hepburn sing “Moon River” in “Breakfast At Tiffany’s”? My sister was my Fred. I loved her and always protected her as well as I could for a person who was a child herself. My sister understood me, knew my life, understood how I thought, liked what I liked, and accepted me. Having someone in my life who understood me like that made me feel whole. A kinship like that might be the rarest thing there is in this life and I lost her, tragically, in adulthood. I have never been able to replace the part of me that was lost with her and I don’t expect to in this lifetime, but I long for it fiercely. Just like Holly Golightly, my life has been defined by the loss of my Fred. On this trip especially, my desire for a kindred spirit to reenter my life was very much with me. I would say that, for whatever reason, that longing was the very impetus for my journey to the Arizona desert, to the region that was my father’s homeland. I was looking for this thing I needed, a connection, to effortlessly feel seen, understood, appreciated, and accepted. I guess I thought that maybe the land would speak to me through the ruins of its people and welcome its child home. And perchance, if that were to happen, I could re-experience the childlike glee of sharing a hobby with someone who would call it play, and there would be Fred, and I would be happy and free. Feeling very much alone on my walk out of the wilderness, suddenly a man appeared walking toward me into the wilderness. He wore an expedition pack with a sleeping pad and carried in his hands a couple of gallons of water. We stopped to greet each other and chat. He was incredulous to see a woman all by herself in this remote location.“What are you doing out here? !” he asked. And then he said, “I live near here and come exploring out here all the time. NEVER in all of these years have I EVER seen another human being up here. And you’re just out here all by yourself exploring and you’ve never even been here before? 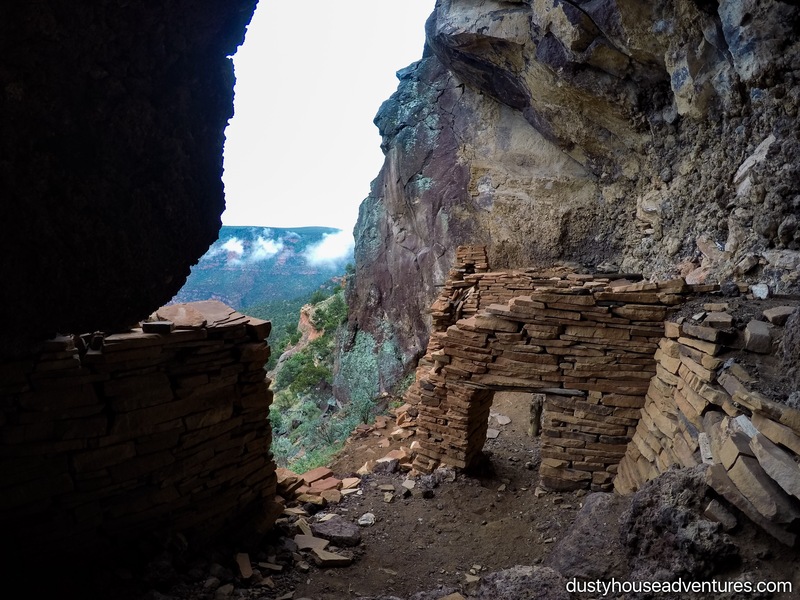 Incredible!” I explained that I’d been looking for a particular cliff dwelling, but hadn’t found it and was now on my way out. 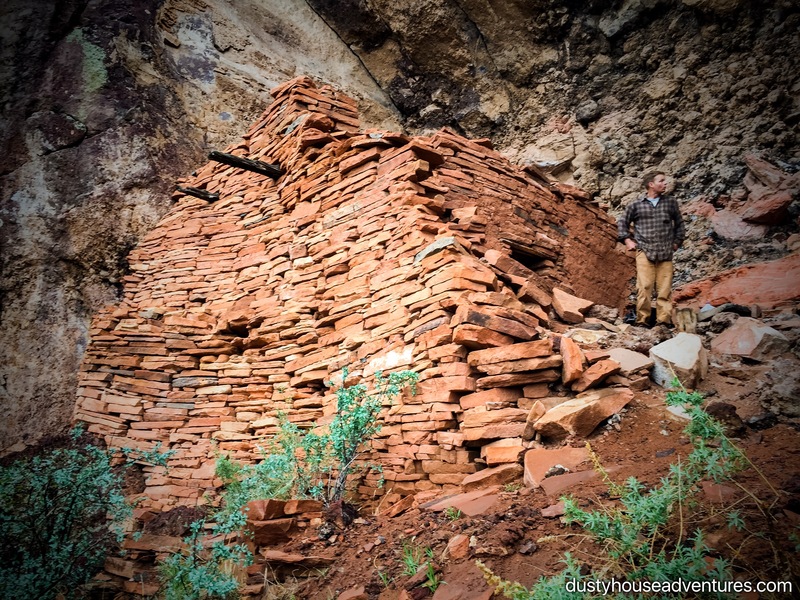 He told me that he’d come up to explore a different cliff dwelling in which a native legend talks about “the three witches”. He confessed that at first, when he saw me in the distance, he thought that perhaps I was one of the witches, “a skin walker”, and he still wasn’t quite sure I wasn’t. He asked to shake my hand just to prove I was real and that he wasn’t about to be eaten in a black magic, cannibalistic ritual. We shook hands. He told me his name was Eamonn. And so it begins. He offered to let me accompany him on his adventure. I was unprepared for an overnight trip, with only an emergency blanket bivvy I’d tossed into my daypack at the last minute to serve as shelter. I was totally out of water. The weather forecasted thunder storms and heavy rains in a few hours and even he only had one small tarp that he planned to use for shelter. He volunteered to let me use any of his camping gear or extra clothes that I needed, I could see that he had plenty of water, and he said he, coincidentally, even an entire extra Thai food takeout meal that he’d purchased in advance of an unsuccessful effort to convince one of his friends to come out with him that night. The pros and cons of this proposition were weighing up pretty evenly in my estimation except for one huge, insurmountable con. THIS GUY WAS A TOTAL STRANGER IN A REMOTE WILDERNESS who had the potential to be a sadistic fiend who planned to flay me alive and spill my guts on the desert for ravens to devour as I watched life fade in a fury of horror and pain. I said, “YES to the HELL YES.” And turned right around and followed that guy straight back out into the wilderness with a song in my heart and a nagging fear that I would not survive the night. Who of us ever has a guarantee of surviving any night, I ask you? We’re all going to die eventually. Dark approached and we started looking for a place to hole up out of the storm. The desert is not the best place to be stuck in a rain storm because there is almost nowhere to hide. Trees are more like shrubbery and the ground is rocky and covered with spiny plants and riddled with snake holes. Cataloging our survival gear, I had rope, an emergency bivvy, and duct tape, he had a small tarp, a sleeping bag, a sleeping pad and extra clothes. Our plan was to rig the tarp up over us as a ramada and hope for the best. We were looking for suitable trees to anchor the tarp to when we rounded a corner and parked in the middle of nowhere was a Conservation crew truck with a trail work gear trailer attached. No people. No road either that I could see. Just the truck parked there looking very much to me like a hotel. Eamonn explained to me that there was a very long, rough jeep road that came up the back side of one of the mountains and that the conservation group probably parked it out there as a place to store gear so they could satellite out to do invasive species removal work, etc. Good enough for me. The truck was locked, but I was eyeballing the height of the crawlspace under the trailer. It looked to me like the perfect size to shelter two hikers in a thunderstorm. We taped the tarp to the wall of the trailer and secured it to the ground with rocks for extra wind protection then sat down next to our little wilderness hotel to eat Thai fried rice and become friends. The coincidences that began to fall from this experience were too many to be believed. Both parents to two young boys we discovered that we had many exceptionally specific life challenges we were trying to work out with regard to parenthood, partnerships, families, life goals, and friendships. We had similar prisms through which we viewed questions of mysticism and spirituality. Also, our interests, hobbies, and the music we enjoyed turned up being the same same and same. But it wasn’t like just having things in common, it was more like hearing someone else talk to you about yourself. How to explain this surreal conversation? Talking to him was like talking to myself, but from a different point of view. He would start describing a life situation he was trying to work out for himself and as he talked it through it was like he was describing the exact same thing I had been puzzling intensely over, but the insights he had to offer about the situation were unique to my perspective and really helpful. Later, he confessed to having the same experience when I talked. It was like being alone, but suddenly having a really creative committee to think through solutions to old problems in a new way. It was so bizarre and it felt supernaturally unreal. I have never had a conversational experience like that before in my life and to be having it with a solitary stranger I’d met in Indian Country wilderness seemed mystical. When we realized that we were both experiencing this strange confluence of the mind, he shared a prophecy he’d recently received that now made sense to him. He told me that he’d been at the laundromat and a verbose crazed woman told him, “You will meet yourself in the wilderness.” He said that at the time it seemed a really oddball prophecy and too creepy to consider. But now… Prophecies usually sound strange, but I think it is because we hear them too literally. That evening we both met ourselves in the wilderness. What nobody could have expected upon hearing it prophesied was that “yourself” would be another person who could reflect you back to yourself from a unique perspective and offer guidance. What a mystery. What a gift. What magic. When we got tired, we tucked ourselves under the trailer and the storm rolled in. Wind seemed to come from every direction and the rain pelted down on the trailer. We were quite snug in our little cave. While safe from the rain, we were concerned about lying underneath the only metal object for miles around when there was a risk that lightning may strike, but with no better options we stayed the course. Sleep? Not much. From time to time I would pass out from sheer exhaustion and sleep for 30 mintues or so, but most of the time we just talked, laughed at how funny it was to be sleeping under a truck in the middle of nowhere with a stranger, and told a few ghost stories. Freezing dawn finally came and we were both still alive and awaiting the break of day so we could emerge from the truck dwelling and go find some cliff dwellings. An explorer of this part of the desert, he was well acquainted with the hidden archaeology tucked around these cliffs. He offered to forego the adventure he’d come to seek in order to help me find what I’d been looking for. I accepted gratefully and we set out to play in the wilderness. A juniper tree we think was harvested by the natives for building the cliff dwelling. We picked up and admired simple rocks whose colors had been exposed and intensified by rain. We puzzled over some strange petrified tubes, vacillating between thinking they were bone or ancient sea slugs. We dug through a scattering of obsidian arrowhead flints like it was a kindergarten sandbox. See scrambled over swirling, multihued sandstone waterfalls that trickled last night’s offering. Within an hour of determined hiking Eamonn had led me to a side canyon on the other side of the mesa I had explored the day before, and there it was. Spectacular. This was a shelter where a tribe of perhaps 30 Verde Hohokam (descendants of the Southern Sinagua) would have lived around the year 1200. 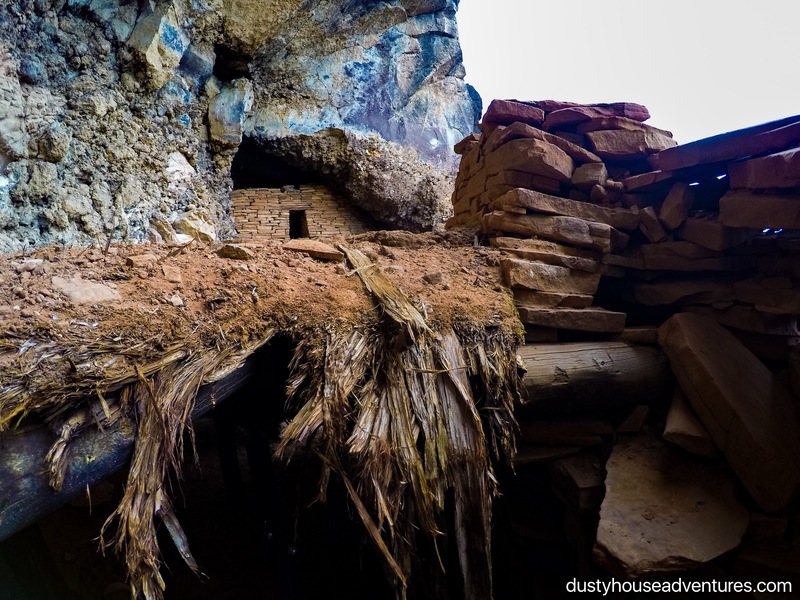 The entire complex was nestled under a rocky overhang in the cliff. 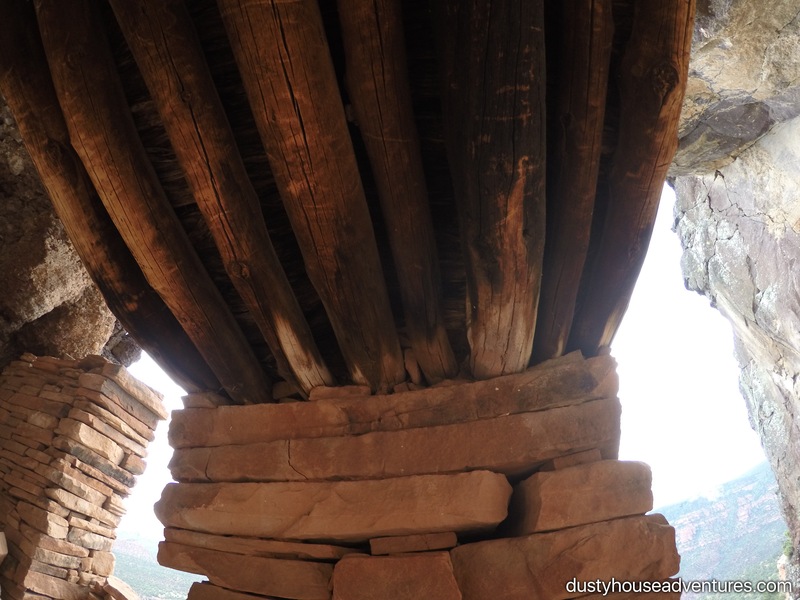 The walls were constructed of sandstone masonry brick supported by shaggy bark juniper support beams. 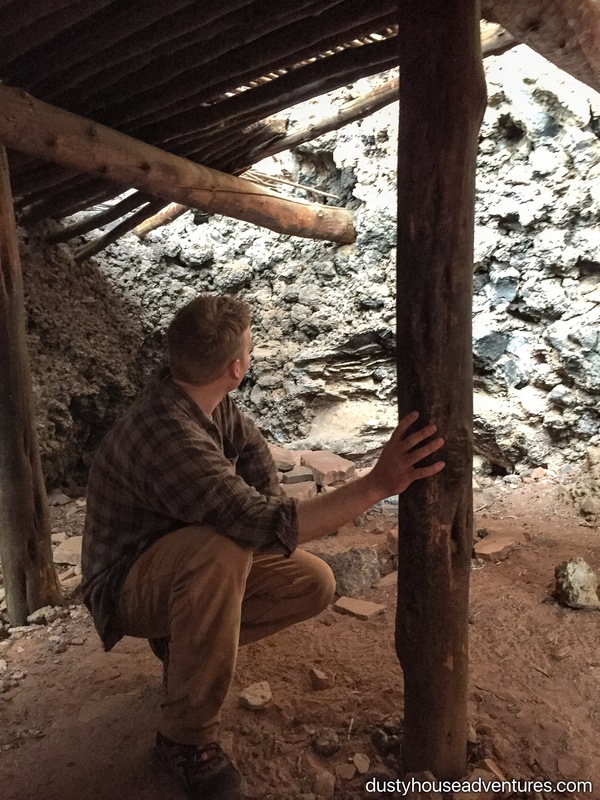 The rooms had low, 3 foot tall doors and the ceilings were layered with beams, mud, and juniper bark. The ceiling of the lower level would likely have been the floor of an upper level. The ruin had four standing rooms and an ancillary storage cave. Judging from the residue of masonry on the rocks above the remaining rooms and the amount of fallen brick on the cliff below, I think it used to be a two story building. 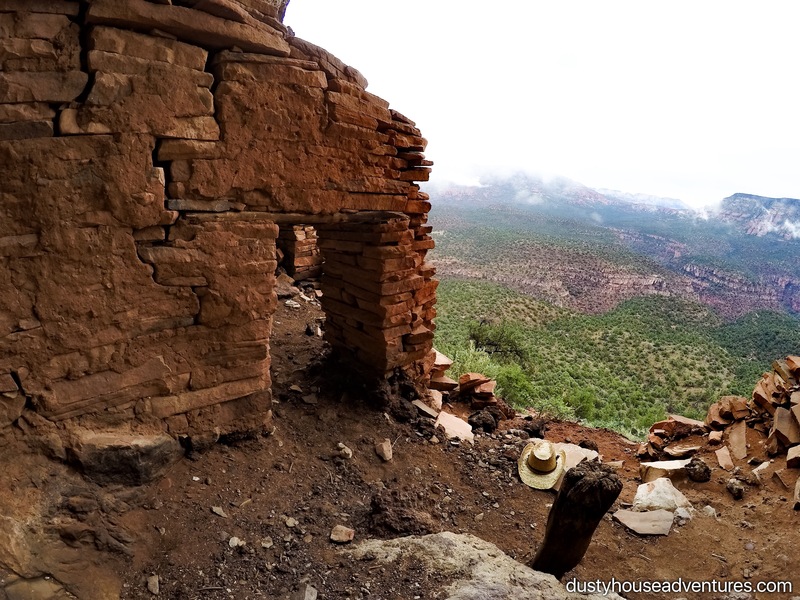 After exploring the ruin we sat in the center open space of the complex overlooking the canyon for a long time feeling happy. The valley plunged below us serpentining around high islands that had withstood the erosion of the river. Range upon range of mountains fell away in the purple distance. 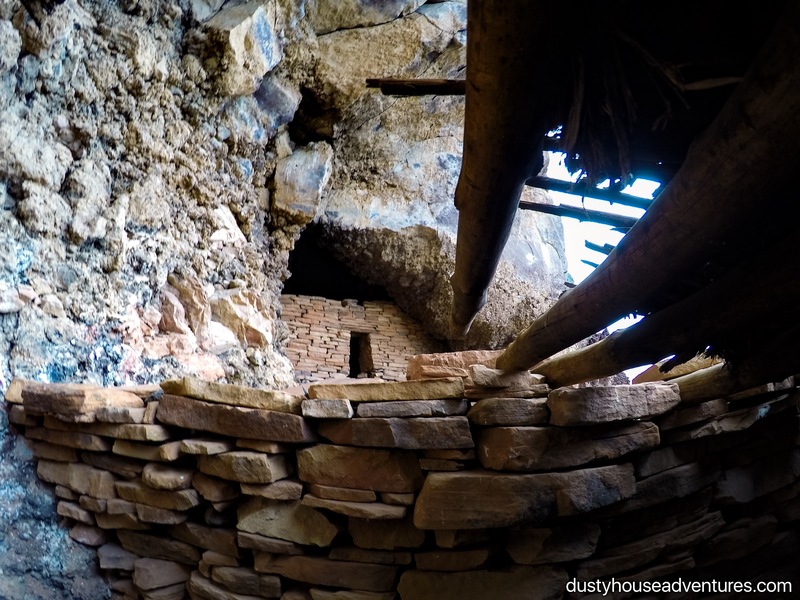 Rain began to fall again onto Arizona outside, but we sat dry and protected from the cool wind in this beautiful handcrafted home. I felt very lucky indeed to have said “Yes” to adventure, “Yes” to generosity, and I said “Thank You” to the universe for taking me off course in order to bring me the treasure that I was really looking for, joyful simplicity with a huckleberry friend. Fred sent the witch searching stranger to you. She knew it was what your soul needed because she, your twin, is living life through you. Just that she is in that “other place”, watching, waiting until that day, far away, when you join her. Extraordinary story! As they say in Hawai’i, it gave me chicken skin. Magic happens. Thank you for saying “yes” to it, and thank you for sharing your story with us. What a treasure you are.